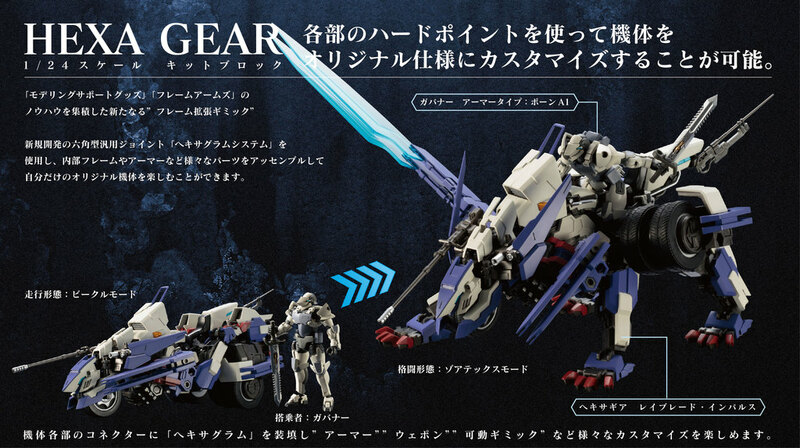 Hexa Gear is a new original series by Kotobukiya that combines the concept of plastic models kits with a block-like system. 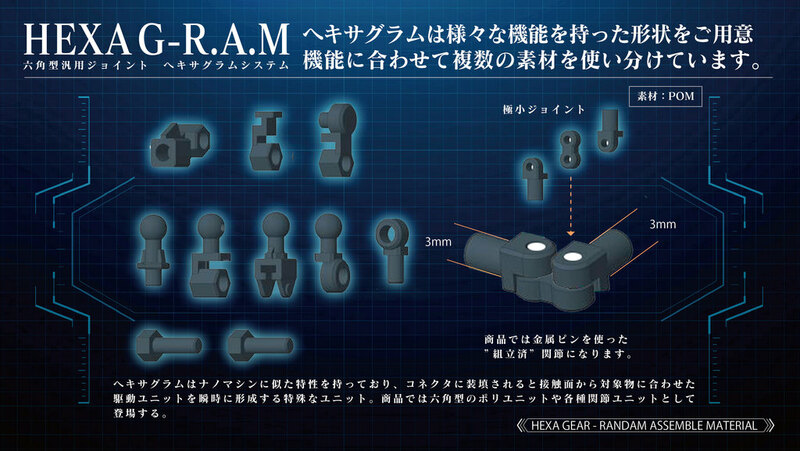 Compared to Frame Arms or M.S.G Modeling Support Goods, Hexa Gear’s kit block system boasts a level of customizability that exceeds the Frame Arms models and Heavy Weapon Units. 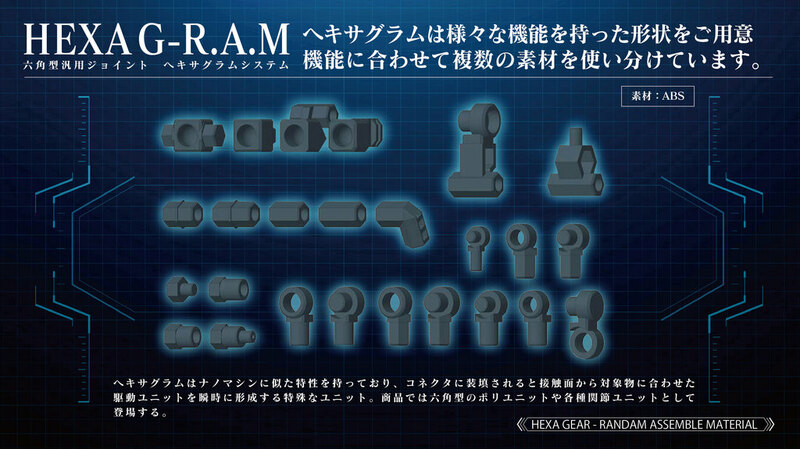 The HEXA G-R.A.M system of hexagonal joints is the base for all of these combinations. 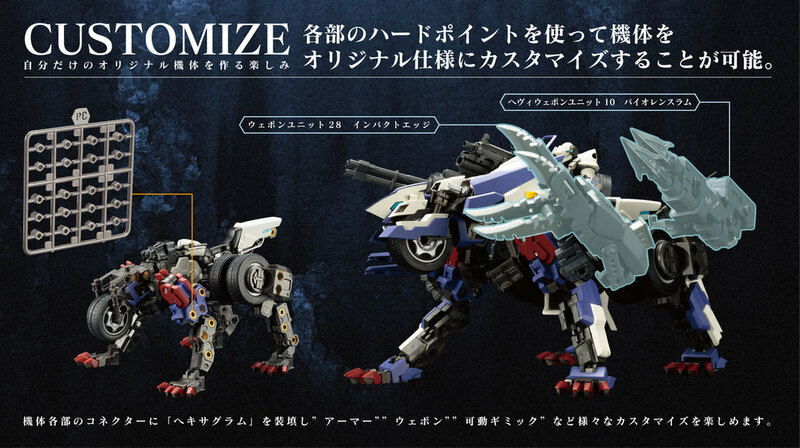 Where traditional plastic model kits are meant to be assembled and completed, Hexa Gear’s novel “Scrap & Build” concept encourages customization and rearrangement down to the frame level. Hexa Gear kits are created using a wide range of materials. 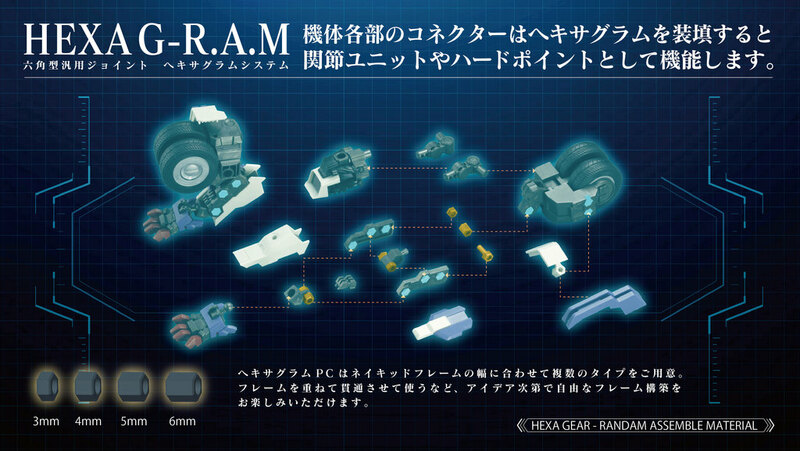 The frames are made of ABS and POM, armor parts are made of PS, and the HEXA G-R.A.M joints are made of PC and PE. Additionally, PVC is also used to create the tread pattern on tire parts in some models. In some instances, such as in small, pre-assembled joints where metal pins and POM are used together to balance strength and size, multiple materials may be used. HEXA G-R.A.Ms are a new type of joint that forms the foundation of the Hexa Gear series. “Governor” is a word that holds several meanings, including “controller” or “regulator.” In the Hexa Gear world, “Governor” is a general title that refers to the engineers and soldiers that handle the machines known as “Hexa Gear.” While this term describes the characters that appear in the series, it also refers to the users who build and customize the models themselves. 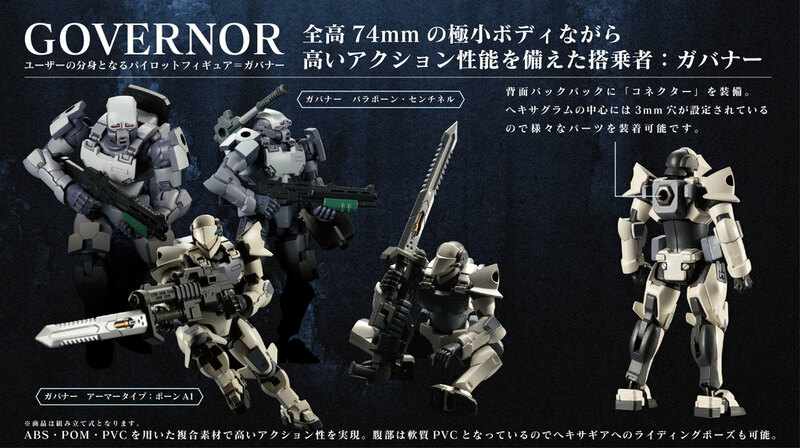 These products are 1/24 scale, assembly-type pilot figures. Made of a variety of materials such as ABS, POM, and PVC, the products enjoy a wide range of mobility despite their miniscule 74 mm stature. These characters are the engineers that come up with limitless ideas to create unique Hexa Gear, and are also the pilots of those Hexa Gear. We hope that these Governors will act as avatars for Hexa Gear users to fully immerse themselves in the Hexa Gear world. Hexa Gear units use the same joints as the Frame Arms series, allowing you to customize your Hexa Gear with a variety of weapon units. 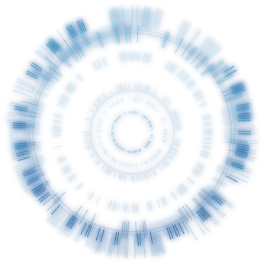 Design your ideal machine by designing and equipping original weaponry to your heart’s content.